Wagner is committed to provide its customers with best Paint Sprayers, those having impressive smooth coating and consistent finishing for indoors as well as outdoor paint jobs. Wagner has been striving hard to provide you with powerful spraying ability and full coverage. 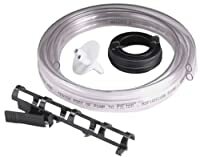 Not only that, Wagner Paint Sprayer Replacement Parts are also available in case you need to replace any part of the machine due to malfunction or any other reason. 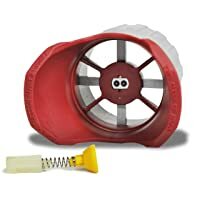 Providing you with everything you need to make your painting experience more fun and less tedious, Wagner has floated many Sprayer Replacement Parts to facilitate you. So don’t hesitate and avail this wonderful gadget that will do wonders for you! Wagner Piston Repair Kit is available for repairing the damaged or worn out piston of your Wagner Paint Sprayer. Wagner Piston Repair Kit comes with following articles. It should be noted that the average life of a piston and spring varies depending on the kind of material you are using for spray painting.Once it become problematic, change it immediately to avoid any malfunction during spray painting. The company itself makes the Piston Repair Kit as well so it is going to be a perfect fit for your Wagner Paint Sprayer. Wagner Foot Power Suction Set is available for purchase at competitive price. It draws paints or stains directly from the paint can. It comes with the following parts. 5’ Dual Line Hose for drawing material straight from the can. 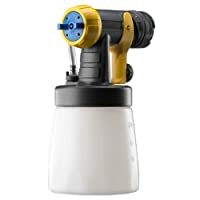 Wagner Foot Power Suction Set is specifically designed to be used with 70-115 watt power sprayers making them completely compatible with Wagner Paint Sprayers. Wagner Atomizer Valves helps you maintain the optimal performance of sprayer gun. As soon as you feel that the spray pattern is beginning to wear off, you should replace it immediately to avoid further damage. Wagner Atomizer Valves comes with the following parts. It is designed for use with Wagner Power Painters. Wagner has designed these valves to be perfectly compatible with its Paint Sprayers. So it is very easy to replace old atomizer valve with the new one. It is available in convenient two pack. Wagner Detail Front End Kit generates controlled fine spray pattern and provides detailed finishing for your projects, especially small surface projects that need accuracy and finesse. It is manufactured by Wagner using high-end innovation. It is available with compatibility with all Wagner HVLP Sprayers. It comes with adjustable flow control to give you precise spraying according to your needs. It has three spray pattern settings to be precise. It includes horizontal, vertical and round (narrow) spray settings. It comes with no wear parts for its long life and durability. It has following parts. It showcases adjustable flow control for precise spraying of paint according to the surface. It has four spray pattern settings which include horizontal, vertical, narrow and wide. It has the ability to spray unthinned residential coatings. iSpray Front End Kit has been built to last for a long time. A handy accessory for spray painting is provided by Wagner in the form of Backpack Accessory Kit. It comes with shoulder strap kit for using it as a backpack or even as a sidepack, whichever is convenient for you. It has 1 gallon capacity for storing paints at a time. It showcases Backpack liners for fuss-free cleanup. Wagner has designed it to take less time in filling while giving more time in spraying the paint and getting the job done in minimal time. 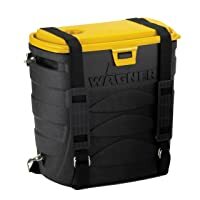 This backpack is only designed for Wagner; so it is advised not to use it with any other brand. 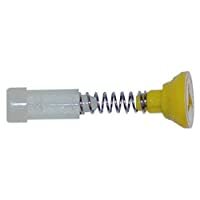 Wagner Tilt Optimus Dual Tip and Atomizer Valve are manufactured for use on Wagner power painters. It is designed with EZ Tilt technology. For horizontal and vertical spraying, adjustable fan pattern setting is available. The material used for its construction is Tungsten Carbide for durability and long life. This Atomizer Valve is designed only for Wagner Power Painters with built in EZ Tilt technology. It is used to spray Latex and oil-based paints, stains and seals and give a perfect finish to the job. It is available in competitive price online. 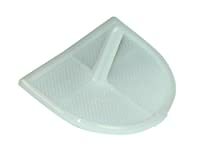 Wagner Filter for Inlet is an authentic replacement part made for Wagner Paint Sprayers. An important component of Wagner Paint Sprayer, this Filter for the Inlet prevents the blockage of pump and spray tips due to solid particles that may enter the pump. This ensures smooth flow of paint and the paint sprayer applies thin and smooth paint coat without clogging of paint during the process. This inlet is specifically designed to be used for Wagner Paint Sprayers so it will be a perfect fit. It is available as an individual replacement part. G Thread is available in the market as an individual replacement component. and also includes saddle and seal Carded. It helps in reducing paint build-up on the tips of the sprayers keeping the tips open for paint spraying. It’s easily available online in reasonable prices. Wagner ProCoat Airless Spray Hose is available in individual capacity as a replacement part of Wagner Paint Sprayer. It is made with Yellow Commercial grade material. It can be used with all Wagner and Titan, Airlessco and ASM. It includes ProCoat, PaintCrew, Twins Strokes, Impacts, Diaphrams, ProGold, Advantage and Graco. For further details, you can always refer to the manual. Wagner Replacement accessories include Flexio Spray Jet Kit. It is designed to fit Flexio 570 and 590. It includes genuine OEM part. refer to the manual of your Wagner Paint Sprayer available with your kit. It is available on all major online stores in competitive rates. Wagner Outlet Valve is available in reasonable price from major online retailers and is sold as an individual replacement part. It helps to repair the outlet area of the paint sprayer if it gets damaged. This component is manufactured to fit Wagner Paint Crew 770, XTRA and PF20 parts. This part usually last up to 25-35 gallons depending upon how coarse the fillers are in the paint being used. It comes with instructions so its replacing mechanism is extremely easy. Let’s look at the various parts of the Wagner Power Painter. EZ Tilt Flexible Suction Tube – The tube is present in all the three Wagner’s models and facilitates spraying no matter the direction the machine is pointed. It enables you to spray straight up on gutters or down on decks with a superb finish. Sure Prime Suction Valve – The sure prime suction valve removes the need for priming after every refill. It enables you to refill the container and start spraying immediately. Material Select Lever – The unit comes with a material select lever at the back of your machine. This enables you to make the necessary adjustments to the material you are using. 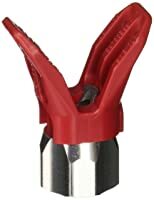 Adjustable Spray Tip – The tip enables you to set it to produce either vertical or horizontal pattern when you spray. You can easily perform a professional look with this unit. Tungsten Carbide Piston and Cylinder – This part enables the machine to be more durable since it can withstand harsh abuse. It last longer than any other brand of the sprayer. Optimus Dual Tip – The tip is more superior than what is found in other models. As opposed to only a single-orifice tip, the tip forms a low-pressure vacuum between 2 spray jets. This draws more paint into your spray pattern to produce a professional look. Carrying Case – The package comes with a carrying case that makes it easier for the user to carry the unit whenever they want. The unit is lightweight, which makes it even better for carrying around. 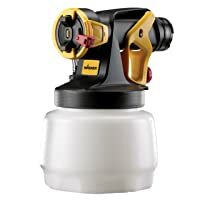 Wagner Paint Sprayer Accessories are available online at very competitive rates made to last for a long time. They are available in individual capacity that makes it easier and economical for you to buy them as per need. Most of them are compatible with all Wagner Paint Sprayers but for others, their manuals are available to provide related information. The details of replacing mechanism are also available in the manuals included with every replacement accessory.